American Westerns from the 60s and 70s could be characterized as dark, moody parables with complicated characters struggling through rough, unforgiving landscapes. Though Arnaud des Palliéres’ Age of Uprising: The Legend of Michael Kohlhaas takes place in 16th Century France and is in French, the spirit of John Ford runs through this revenge tale in an unmistakable way. 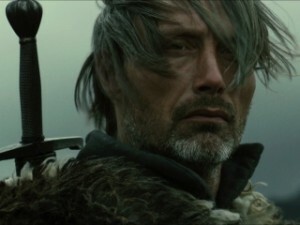 Based on a 19th Century German novella, Age of Uprising stars Mads Mikkelsen (Valhalla Rising) as Michael Kohlhaas, a horse merchant who has been wronged by the local baron. When the feudal system of government fails him, resulting in his wife’s death, he kicks into vigilante mode and goes after his perpetrators, killing anyone in his path. His cause attracts serfs and peasants who are similarly disillusioned with the current hierarchy, becoming a threat to established rule. Mads Mikkelsen seeks justice and revenge in Age of Uprising. But Age of Uprising is about as far from Robin Hood or Batman as you can get. Nothing about the film is black-and-white, other than the fact that an injustice was done. Kohlhaas takes up his sword for good reason, but every step he takes brings him further into moral uncertainty. The overly-dark and claustrophobic cinematography and sparse dialogue add to this sense of existential murkiness, slowly establishing an Eastwood-like character that you can’t quite nail down. Kohlhaas is a decent man who loves his family, treats his servants well and believes strongly in the Christian ideals. Yet, as an encounter with Martin Luther (or John Calvin?) reveals, he’s standing on shaky moral ground. A confession with Luther turns into a revenge manifesto. When his daughter asks him why he’s fighting, he can’t respond. His righteous crusade is plagued with uncertainly, and by the end of this tale, you’re neither cheering nor booing- but you’re definitely affected. What makes Age of Uprising a great film, however, is that it ultimately does has something to say, or at least ask, that makes all this uncertainty pay off. It’s a difficult film to watch, one that explains nothing and forces you to work hard just to get a sense of what’s going on. But once you tune in, you’re hooked; each scene provides insight into the previous one, slowly revealing its portrait of a man aiming high and realizing his own shortcomings a bit too late. The questions Uprising raises linger in your mind days later, and scenes such as one where Mads Mikkelsen assists a mare in giving birth to a colt (which is clearly not a special effect) are so raw and powerful it’s hard to imagine you’ll ever forget them. The extras make this DVD worthwhile: you get Cannes Film Festival interviews with both Mikkelsen and des Palliéres (where you learn, among other things, that Mikkelsen had to learn French just to do this role) as well as several deleted scenes, some of which would have helped clarify the sometimes-obscure plot. The theatrical trailer promises the Hollywood Revenge tale that Age of Uprising most certainly isn’t. Check it out, after the feature, for a quick laugh.